Oscar, a 10-year-old male castrated Yorkshire terrier, presented to the Tufts Foster Hospital for Small Animals at Cummings School Radiation Oncology Service for a several month history of nasal signs. 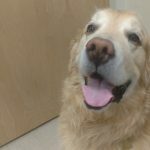 Oscar’s owners initially noted increased sneezing and increased respiratory noise/congestion approximately six months prior that was non-responsive to treatment with steroids and antibiotics. Intermittent unilateral epistaxis was then noted approximately three months prior. This progressed to a mild but noticeable facial deformity approximately three weeks prior to presentation. On presentation to Foster Hospital for Small Animals, physical examination revealed a mild facial deformity over the dorsal maxilla. There was no evidence of nasal, ocular, or aural discharge but no airflow was present from the left nare. Nuclear sclerosis was present bilaterally and retropulsion of both eyes was normal. Mild dental calculus was present. The mandibular lymph nodes were mildly enlarged but soft and symmetrical. Thoracic auscultation and abdominal palpitation were unremarkable. 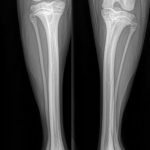 Based on examination findings, what are your primary differential diagnoses? What further diagnostics would you consider, and what treatment options would you recommend? Based on the clinical history of epistaxis and presence of facial deformity, neoplasia is the primary differential diagnosis. Adenocarcinoma is the most common nasal tumor in dogs. Additional neoplastic considerations include undifferentiated carcinomas, squamous cell carcinoma, fibrosarcoma, chondrosarcoma, osteosarcoma, and lymphoma. Non-neoplastic differentials are considered less likely, but include fungal infection (aspergillosis most common), other infectious rhinitis, or foreign body. Figure 1. 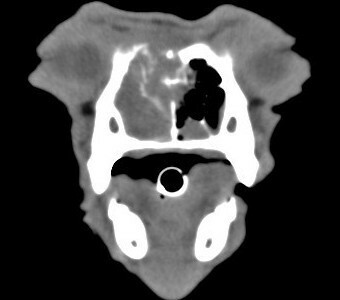 Contrast-enhanced, soft-tissue window CT image of the initial CT scan, displaying a large, destructive heterogeneously contrast-enhancing, left-sided nasal mass, extending into the right nasal cavity invading into the right size with destruction of the left nasal and maxillary bones. A diagnostic workup for nasal tumors includes obtaining a sample of cells, usually through a biopsy to establish a definitive diagnosis. Options for biopsy include transnostril core sampling, blind or rhinoscopy-guided pinch biopsy, nasal flushing or punch biopsy of facial deformities. The latter option was performed on Oscar and histopathology revealed nasal adenocarcinoma. Staging tests then helped to determine the extent of disease through the body as well as a dog’s general health. These tests included blood work with a complete blood count and serum chemistry profile, urinalysis, chest x-rays, abdominal ultrasound and aspirates of the regional lymph nodes (if enlarged). This information is used to develop the best treatment plan for an individual patient. Oscar’s blood work and urinalysis were unremarkable. An abdominal ultrasound revealed hepatic and splenic nodules. Ultrasound-guided fine needle aspiration of the hepatic nodules revealed moderate hepatocyte vacuolization, a suggestion of glycogen deposition, and fine needle aspiration of the spleen revealed reactive lymphoid tissue. The mandibular lymph nodes were aspirated and found to be reactive. Oscar subsequently underwent a CT scan of his head for radiation therapy planning and a thoracic CT scan to complete staging. The CT scan revealed a large (1.7 x 2.7 x 3.1 cm), destructive, heterogeneously contrast-enhancing, left-sided nasal mass, extending into the right nasal cavity invading into the right size (Figure 1). The mass was causing destruction of the left nasal and maxillary bones, the right and left aspect of the cribriform plate and the left palatine and frontal bones with extension into the left retrobulbar space. The left mandibular lymph node was mildly enlarged. There was no evidence of pulmonary metastasis. Nasal carcinomas are the most common type of nasal tumor in dogs, accounting for ≥50-75% of all nasal tumors in dogs. Nasal tumors are relatively common in older dogs and long-nosed dog breeds seem to be predisposed. 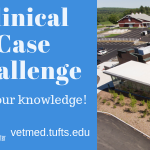 Nasal cancer is a progressive disease, that mostly affects dogs through space occupation, local destruction, and invasion of nearby tissues and can lead to clinical signs such as nasal discharge, nose bleeds, facial deformity, and occasionally neurologic deficits (such as seizures). Metastatic potential to other areas of the body is low with nasal carcinomas (<30% metastatic rate), but it can happen, and usually occurs in the lymph nodes and lungs, often later in the disease course. 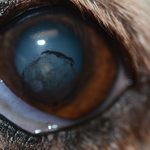 Surgery is not typically recommended for nasal tumors in dogs due to the location of the tumor and inability to remove the entire tumor. Definitive radiation therapy allows for the best control over future tumor growth with the average survival time being 1 to 1.5 years for most nasal tumors. This treatment plan typically involves 16-19 daily treatments (M-F) under a light plane of general anesthesia. There are some short- and long-term side effects associated with definitive radiation therapy. Short-term side effects typically arise midway through the treatment cycle and peak around the end or 1 week following completion of radiation therapy before healing. Short-term effects include: dry eye and/or conjunctivitis; erythema, hair loss, and dry or moist desquamation of the skin; and inflammation to the oral cavity and throat. We typically manage these short term side effects with oral antibiotics (if indicated), anti-inflammatory medications, pain medications, and topical eye medications. There is also a small risk of long-term effects from radiation therapy, which may develop several months to years after treatment has finished. These effects include: chronic nasal discharge/sneezing, dry eye, cataracts (typically begin to develop around 9-12 months post radiation), bone or soft tissue damage/cell death, and rarely (<3-5% incidence at 3-5 years post radiation) secondary tumor induction. A less aggressive course of radiation, termed palliative radiation therapy, may also be considered. This treatment protocol typically involves either 6 once weekly treatments or 10 daily radiation treatments (M-F), but other protocols are also available. Palliative radiation generally decreases the number and severity of the potential short-term side effects mentioned above to a very mild level, if at all. This treatment plan is associated with a median survival time of approximately 6-10 months for nasal tumors. Figure 2. Graphical representation of Oscar’s 3-D conformal radiation therapy plan. The target volume is represented by the red shaded region. The concentric colored lines represent the dose level as a percentage of prescription dose. Although radiation therapy is considered the gold standard for treatment of nasal tumors, chemotherapy can also be considered. There are two different chemotherapy options: conventional and non-conventional chemotherapy. Conventional chemotherapy for treatment of nasal tumors is typically intravenous therapy with a platinum agent, such as cisplatin or carboplatin. Reported response rates are low at approximately 30%. Non-conventional chemotherapy for treatment of nasal carcinomas includes use of the small molecule inhibitor, Palladia. There is little clinical research regarding response rates with Palladia treatment in nasal carcinomas but anecdotally it seems to have some efficacy. Figure 3. Contrast-enhanced, soft-tissue window CT image of recheck scan at 7 months post radiation therapy, displaying resolution of the previously described contrast enhancing soft tissue mass associated with the nasal cavities but persistent loss of the left nasal and maxillary bones. In the case presented herein, after discussion with the owners, definitive radiation therapy was performed. Oscar underwent 16 daily radiation therapy treatments (Figure 2). Halfway through the radiotherapy course, the facial deformity was nearly completely resolved. Epistaxis also resolved. He experienced moderate inflammation to his skin and oral cavity secondary to the radiation therapy, which resolved by 2 weeks post radiation therapy. Oscar was subsequently monitored every 3 months via physical exam and thoracic radiographs. Repeat CT scan at 7 months post radiation therapy revealed complete resolution of the previously described contrast enhancing soft tissue mass associated with the nasal cavities (Figure 3). There was persistent right displacement of the nasal septum and loss of the majority of the left nasal turbinates, as well as persistent loss of the left nasal and maxillary bones, left palatine bone, and right and left cribriform plate.